Bilbo Baggins loved maps; in his hall at Bag End, we are told, there hung a large map of the Country Round, 'with all of his favourite walks on it in red ink.' J.R.R.Tolkien also loved maps and they were to play an important part in the writing of his history of Middle-earth. While this boxed set of two volumes was published by Houghton Mifflin in 2003,The Maps of Tolkien's Middle-earth contains text from Brian Sibley dating back to 1994, and the art work of John Howe dating back to 1994 as well. Sibley's text makes for wonderful reference reading, guiding the reader not only through the geography and geology of Middle-earth, but also through the times and Ages of Tolkien's wondrous realm. It is an easy read and an indispensible reference tool. The crowning glory of this work, however, are four glorious maps by illustrator John Howe, that can only be considered far more art than topographical reference. Each of the four maps is bordered by Howe's incomparable Tolkien art, making the map collection worth the price of the boxed set in and of itself alone. This is a must for any respectable Tolkien library. ♦ Map #1 - The Hobbit: is the map of Bilbo's journey resplendent with Howe's depiction of An Unexpected Party. 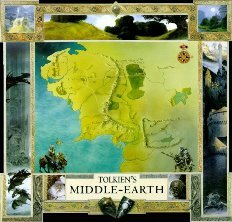 ♦ Map #2 - Tolkien's Middle-earth: is pictured in much reduced size above (each map being a 3ft. x 3ft. square). This map is surrounded by Howe's superb illustrations of unforgettable characters and places in Middle-earth. ♦ Map #3 - Beleriand: depicts Beleriand and the Lands to the North. Most striking is Howe's illustration of Angband that dominates the top of the map. ♦ Map #4 - Númenor: is a truly glorious piece of art work with the map of the ill-fated island highlighted with depictions of it's fall and it's fabled ships.